Would it be possible for you to host a dinner if all your plates did not match? What if at the last minute, you realized you did not have 8 matching plates for all the guests invited to dinner. You had time to run out and buy more plates but time was tight. What would you do? This happened to me recently, but I wasn’t going to let it stop me from having friends over for the nice dinner I had planned. I confess I made one little comment to cover the miss-match but got the OK from my friends to let that go. When the food was on the plates it did not matter that the plates did not match; the four new recipes I was trying out on my guests was perfect. They raved about the delicious food and wondered if I’d share the recipes. 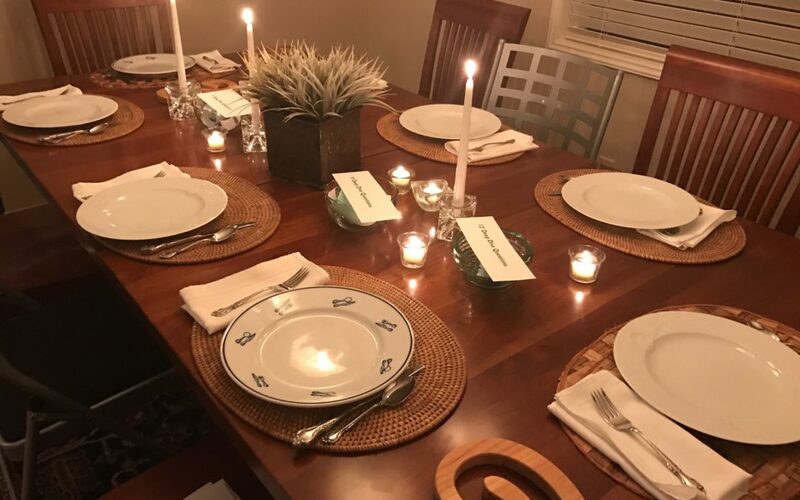 I had to drop the feeling of worthlessness about not being better prepared and remember the purpose of the dinner was fun and fellowship and good conversation, which we had even without matching plates. Thinking back, I could have made every other plate a different design and it might have looked more intentional but my focus was on the guests and the meal I was preparing. I don’t have to be perfect to enjoy my friends! Place a few candles and keep it simple. Set the stage for deep conversations. Pre-set guidelines so it doesn’t become a heated debate. In the picture above, I had three levels of questions. I’m calling them my “Deep Dive Dinner” and that was the theme of the night. You can choose your own topics with different levels but allows for discussion an intimate conversation. Everyone at our party was over 60 and open to talking about life in their final third. The questions were around legacy, who they are leaving it, and what is truth. What about you, did you plan for your legacy in your 20s and 30s? I enjoyed your comments about focusing on what’s important over a deep dive dinner experience. Towards this aim, you might want to check out a special website called deathoverdinner.com. Its all about encouraging the public to hold private dinner parties where death is the subject and this website helps in really significant ways to prepare for it.